With a loud clang of a bell, a “magbibinatog” would remind us the best part of every afternoon siesta. Binatog is a traditional Pinoy merienda commonly served with grated coconut meat and salt to taste. Back in the days, binatog was usually peddled through wooden carts or a bicycle with two containers hanging on its side. 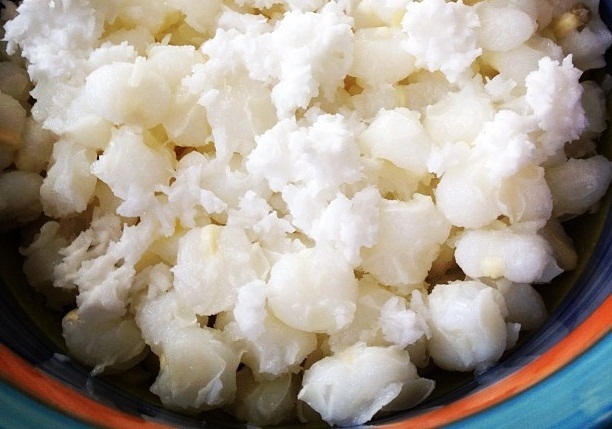 Binatog is made by soaking mature white corn in water and salt until puffed. The soaked corns are then boiled until the skin almost peel off. Excess water is drained and the corn is placed in a bowl or plate then topped with either sugar or salt (sometimes both) and generous amounts of grated coconut. 1. In a cooking pot, pour in the canned hominy including the liquid. 2. Add the 1 cup of water and bring to a boil. 3. Once it has boiled, simmer for 12 to 15 minutes or until the white corn becomes tender. You can taste test after 12 minutes. 4. Drain the water and place the boiled hominy in a serving plate. 5. Mix the boiled white corn kernels, butter, and sugar in a bowl. Finally add the grated coconut. Add a dash of salt for a distinct salty flavor. *When cooking with dried hominy, soak dried kernels overnight in water. Rinse, place in a pot, and cover with water. Simmer for a few hours until kernels burst open.